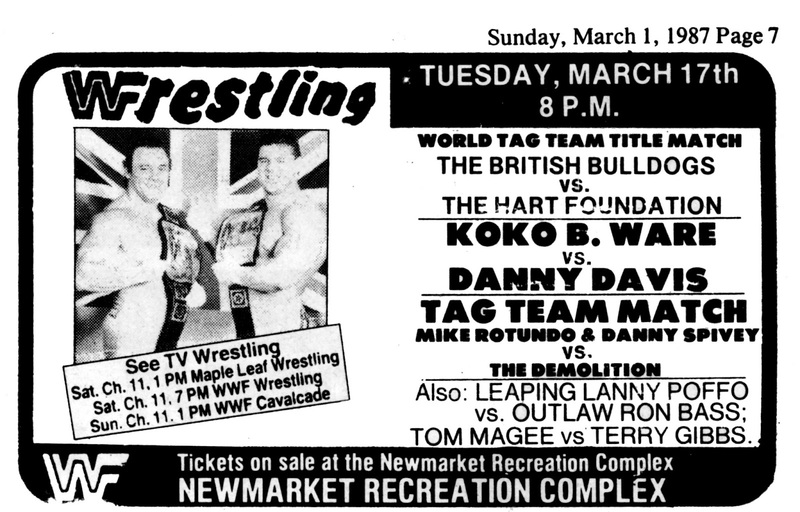 Wrestling came back to my home town of Newmarket, Ontario on March 17, 1987. 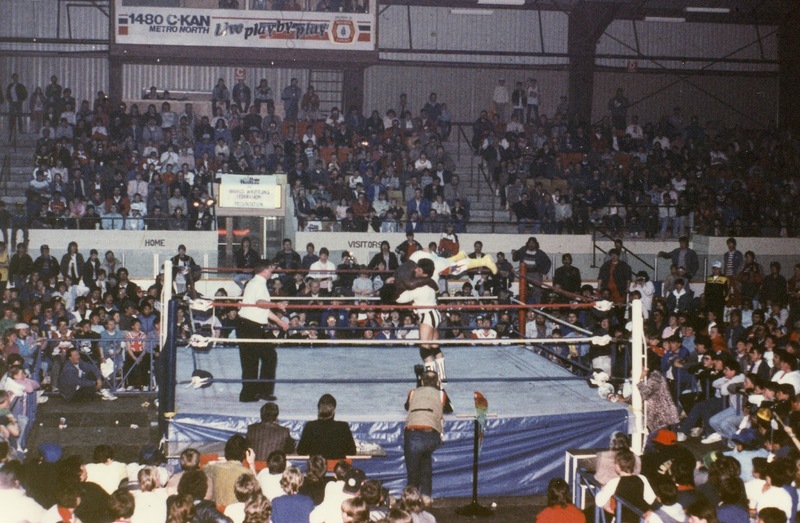 It was just days before WrestleMania III in Pontiac, Michigan, and the WWF crew was working hard all over the United States and Canada. One neat thing about WWF shows of this era is how often you'd get to see jobber vs. jobber matches. Sure, you knew S.D. Jones was going to get flattened by King Kong Bundy, and The Red Demon would barely get any offence in against Junk Yard Dog. But how would Jones and Demon fare against each other? Well, let's put them together! So, we got that match. We got Tom MaGee, who we hadn't seen on TV yet, against Terry Gibbs. Magee had the looks but not the talent. And you might think Ron Bass would get some stiff competition from poetic autofellator Leaping Lanny Poffo. No. Despite being Randy Savage's brother, Lanny was laying down for all the up and coming heels. The crowd went nuts for the hot new tag team in the WWF, Demolition. I think they were still under the management of Luscious Johnny V at this point, though he wasn't at this show. Here are Ax and Smash preparing to take on "Golden Boy" Danny Spivey and... let's check the program.... oh, that's ??????????. I've checked around, and I'm pretty sure we're looking at Jerry Allen. Fans may remember that Spivey was a little bit stranded at this point. See, Mike Rotundo (or Rotunda) (the guy now famous for being IRS) was teamed up with Barry Windham as the American Express, or US Express. Hulk Hogan's "Real American"? Yeah, that song was really for Windham and Rotundo -- listen to the Wrestling Album. It's right there on the record. Hulk had "Hulk Hogan's Theme" and it sucked. Anyway, Windham left. He joined the Four Horsemen, whoever they are. The WWF had another tall blonde guy around: Danny Spivey. So they put Spivey with Rotundo and tried to make magic again. It didn't work. Rotundo also left, eventually landing in the NWA and teaming with Rick Steiner as The Varsity Club. That left Spivey standing alone as a miscast babyface, teaming with ????????? Jerry Allen. Recognize these guys? The man in stripes is former referee Danny Davis, I've written about here several times before. He helped the Hart Foundation cheat to win the tag team titles, so WWF President Jack Tunney suspended him for life. Jimmy Hart scooped Davis up and turned him into a wrestler. Of course, Davis was already a wrestler. He was Mr. X. And Mr. X had tattoos on his forearms and knuckles. That's why Danny Davis always refereed with long sleeves, and now wrestled with long sleeves. It looked ridiculous. Not only that, Davis as a non-masked wrestler was entirely boring. He had some heel heat that carried over from the Hart Foundation association, but beyond that, he was just dull. Compared to that, Koko B. Ware was electrifying. Ware came to the ring to "The Bird" by Morris Day and the Time. (You remember their 1980s hit Jungle Love, and their appearance in Prince's movie Purple Rain. They were also in Jay & Silent Bob Strike Back, I think.) The bird. Yes, he had a bird. 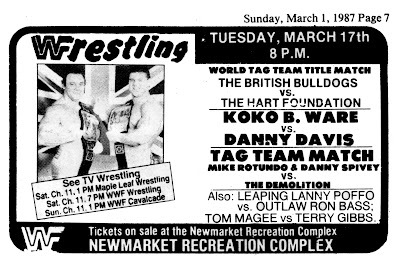 He came to the ring with a bird named Frankie, but here in Newmarket the bird looked different. That wasn't Frankie! Frankie was red! This bird is green. I call shenanigans. 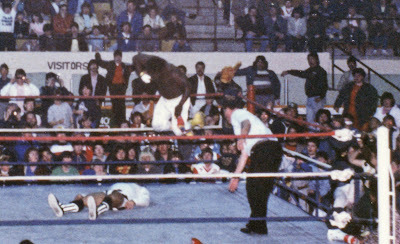 Koko and Davis put on a so-so match until Ware came off the turnbuckles with a Jerry Lawler fist drop. Must have picked that up when the two were big attractions in Memphis. After the show, I got an autograph on my sign from referee Terry Yorkston. WOW! An autograph from a referee! Then I went out behind the arena to see if we could see any wrestlers coming out of the arena. We saw a few. Koko B. Ware came out and he was smelly. Oh my god, I don't think I'd ever smelled body odour like that before in my life. He was a stinky, stinky man. Granted, these guys were on the road for ages, so who knows how often they got to wash their gear. I have no way of knowing if they took showers inside the Newmarket Recreation Complex. But Koko, man, you reeked. Still, I think I shook his gloved hand. It was warm. I remember Demolition Ax coming out and I got to see him without his makeup. 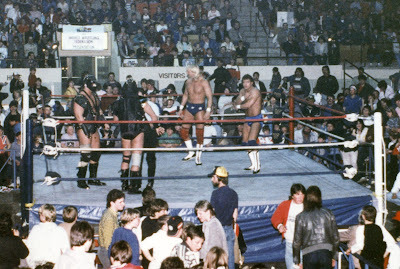 Kayfabe was still partly in effect, so seeing someone like the Road Warriors or Demolition without the face paint never happened. Ax looked old. Tired, exhausted, worn and old. He appeared to have a pockmarked and weathered face. I had no idea at the time that he was Bill Eadie, aka Masked Superstar. 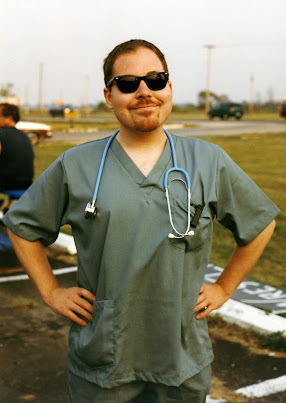 He'd been around for years. I felt kind of bad for him. Ax got in a car with Outlaw Ron Bass and I forget who else, and headed off in their rental car toward Yonge Street. Scripts for recordings are composed in the arrangement called two-section composing. As the name itself infers, the first section, the left side one, is featured AUDIO and whatever sounds you think your video ought to have get clarified in the segment. Keeping in mind the sounds are played, whatever movies you think your video ought to have get clarified in the second segment, the right side one, and it is featured VIDEO. It is as basic as that.